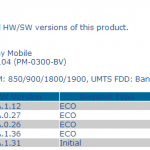 Last time we saw any firmware update for Xperia L was back in early August i.e 15.0.A.2.17 firmware, which was a major update and introduced a lot many features. 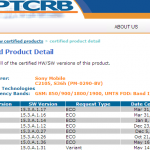 Just now another 15.3.A.0.26 firmware update of new series has been certified on PTRCB website for Xperia L C2105 and C2104. 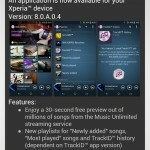 It seems to be another major update for Xperia L now. 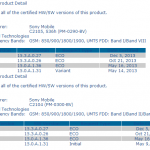 15.3.A.0.26 firmware as compared to previous 15.0.A.2.17 firmware, changes it series from 15.0.A to 15.3.A hinting that something big is coming to Xperia L now. 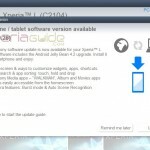 Xperia L at present is on Android 4.1.2 but we think that it may be android 4.2.2 update. Check the 15.3.A.0.26 firmware certification by PTCRB below for C2104 and C2105. 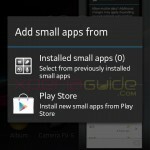 15.3.A.0.26 firmware update for Xperia L is Android 4.2.2 confirmed from the Sources. 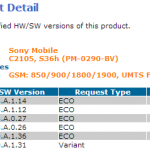 Speculation is there that this new 15.3.A.0.26 firmware update may bring android 4.2.2 for Xperia L but we expect that it may not happen as higher end device like Xperia SP is still on android 4.1.2 which will be directly rolled on android 4.3 as per Sony.